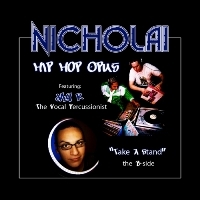 "After years of making music and trying to establish himself as a hip hop producer and artist, Nicholai took a step back, re-evaluated himself and his music, and realized something that was missing. One element was not shown through his music… himself. With this revelation, he decided to scratch everything he was doing, and start over. He wanted his music to reflect who he is, and the kind of music that he listens to. He then realized that much of the music he was making was heavily funk influenced, and decided to embrace this concept and make music that he would come to call "hip hop funk." his music however is not bound by the barriers of a sub genre, his music reflects the vast taste in music that he listens to on a daily basis." I often wonder this... It seems that every generation complains about the music of the generation after. someone who grew up on duke ellington and glenn miller, hated the bepop and rock and roll that came after, just as that generation didn't like the innovative things happening in the seventies, and then they didn't like the hip hop era i grew up in, and I certainly don't like the music being played now for the most part. I always kind of wonder what this generation will be complaining about when they get older. but as far as the industry goes, I believe technology will completely eliminate the major labels, and most the music we will hear will be indie artists. Being from the united states, I really couldn't say that I have encountered any difficulties. then again I have yet to get to that point of my career where i am touring and experiencing other places. But actually maybe that is the difficulty, traveling is hard. On my half of the country, things are so spread out, that traveling to another city is the same distance as someone in Europe going to another country in Europe. I would love for my children to be interested in music. I would never force it on them, other than to broaden their knowledge and to culture them, as my dad did me. To be honest, i can't really say that i understand this question. But if it's meaning what product to I dream of owning. honestly if I was wealthy enough to buy whatever I wanted and not worry about the cost. I would purchase either an original frida kahlo painting, or an original Frank Frazetta. This is in fact a tough one, which I may have to split into 2 variations of this questions. If I were to resurrect one artist for the purpose of working with them, I think it would be Curtis Mayfield, his style of writing would fit so perfectly with a hip hop song. However if it's just to hear them play, without a doubt it would be Miles Davis, the way he brought his sound to current music, I have always been curious about what his music would sound like now.